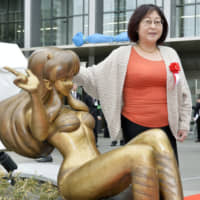 PARIS - Japanese cartoonist Rumiko Takahashi has been awarded the grand prize at the prestigious Angouleme International Comics Festival for her contribution to the development of manga, the organizer of the French event said Wednesday. The 61-year-old Niigata Prefecture native is best known for comedic works including “Urusei Yatsura,” or “Lum” in its English edition, and “Mezon Ikkoku” (“Maison Ikkoku”). She has produced about 200 volumes over a 40-year career, selling more than 200 million copies worldwide, according to the organizer. Takahashi is the second Japanese to win the lifetime achievement award after Katsuhiro Otomo, the creator of the “Akira” manga series, in 2015. The selection this time was made through a vote by some 1,700 cartoonists. The festival, which is to be held from Thursday to Sunday in the southwestern French city of Angouleme, also features exhibits of artworks as well as lessons by Japanese manga artists Taiyo Matsumoto and Tsutomu Nihei. Held every year since 1974, it is the second-largest comics festival in Europe and third-largest in the world.